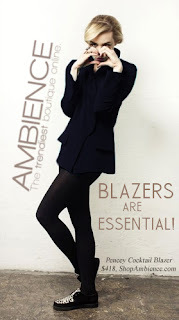 Blazers are a wardrobe essential and the Pency Cocktail Blazer in navy silk is the one to have this season. This blazer has everything going for it.The urban chic style is versatile and can pair beautifully with your leather leggings, mini skirt, jeans or something a tad more conservative for the office. This is one of those pieces that instantly add style and attitude to your look.